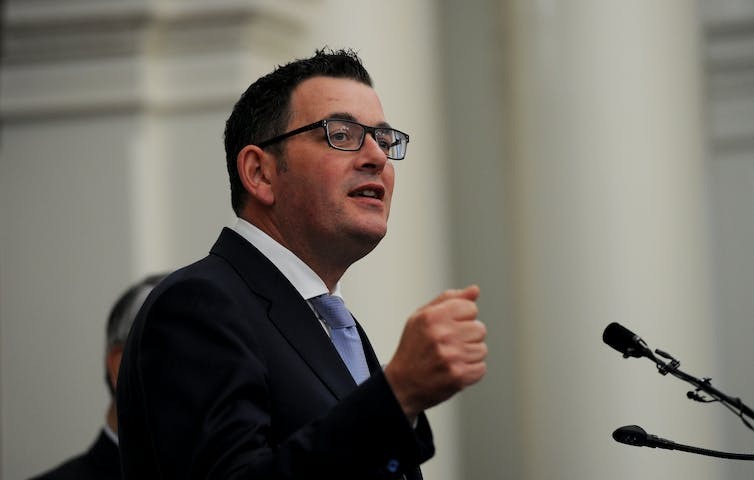 The Andrews government’s proposed reforms will significantly improve Victoria’s donations system. Harsh penalties will be imposed on those who breach the rules, with fines of up to $44,000 and two years in jail. These proposals follow several dubious events, including Liberal Party fundraiser Barrie Macmillan allegedly seeking to funnel donations from a mafia boss to the party after Opposition Leader Matthew Guy enjoyed a lobster dinner with the mafia leader. … help put an end to individuals and corporations attempting to buy influence in Victorian politics. The proposed reforms will significantly improve Victoria’s donations system. The caps on donations will level the playing field and reduce the risk of corruption in the state’s political system. It will prevent rich donors from exerting greater influence over politicians than those who lack the means to do so. Parties will no longer be able to rely on these wealthy donors to fund their election campaigns. The caps equally target individuals, unions and corporations, meaning that money cannot be channelled through shady corporate structures to evade the rules. However, donations can still be channelled through the federal level, where there are no caps. Real-time disclosures, which have already been introduced in Queensland, will improve the timeliness of disclosures. Combined with the lower disclosure threshold of $1,000, these are commendable steps towards enhancing transparency. The move to ban foreign donations may face constitutional issues. The tough penalties may deter people from breaching the rules. But proper enforcement by the Victorian Electoral Commission is still essential for the laws to be effective. How will elections be funded? Election campaigns are currently funded by a mix of public funding and private donations. As there will be caps on private donations, public funding of Victorian elections from taxpayers’ pockets will need to increase. There will be debate as to the level of public funding that should be given. Public funding should adequately compensate parties, but not be overly generous or allow them to rort the system. Detractors may argue that, in the age of social media, there may be cheaper ways for political parties to get their messages across, so less public funding would be needed. It is tricky to work out how to allocate public funding between established political parties, minor parties and new parties. There is also a question of whether public funding should cover activities such as policy development and party administration. But public funding is already part of Australia’s system. In the 2016 federal election, $62.8 million of public funding was provided, which is about half of federal campaign costs. Victoria’s move toward more public funding is not unprecedented. New South Wales already has caps on political donations of $5,800 per party and $2,500 for candidates, as well as a ban on donations from property developers and those in the tobacco, liquor and gambling industries. This was accompanied by an increase in public funding of elections, amounting to about 80% of campaign costs. In Europe and Canada, there are high levels of public funding: between 50% and 90% of costs. Another worry is that enterprising people and businesses might still circumvent the rules through creative means. In the US, super PACs (political action committees) are special interest groups involved in fundraising and campaigning that are not officially affiliated with political parties. These groups can raise unlimited sums of money from corporations, unions, associations and individuals, and then spend this money to overtly advocate for or against political candidates. If this possibility is not regulated in Australian jurisdictions, then our system will remain broken. How can we improve our national system? Australia’s political donations system remains fragmented. Ideally, we would have a uniform system with tough rules at both the federal and state levels, so that donors cannot easily evade the rules by channelling their money through more lax jurisdictions. The time is ripe for reform. A federal parliamentary committee is looking into how to improve the federal donations rules. The committee will issue its report by December 2017. Victoria has thrown down the gauntlet – and it’s now time for the federal government to take heed. 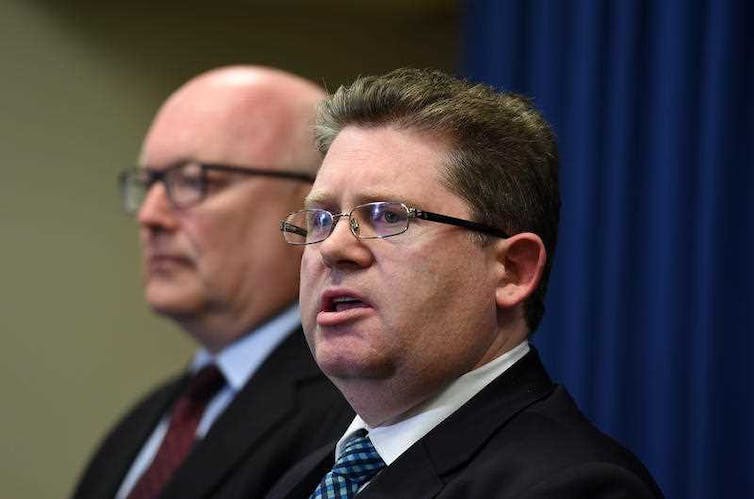 Attorney-General George Brandis (left) and Special Minister of State Scott Ryan need to work together to reform foreign donations laws. Let’s start at the beginning on the vexed issue of foreign donations for political parties and candidates in an environment in which globalisation is adding to challenges in combating foreign interference in electoral processes. Back in 1918, when the Commonwealth Electoral Act was drafted, no distinction was made between donors from Australia or overseas, or (effectively) between donors who were Australian citizens, non-citizens, or organisations. In the last year of the 1914-18 war not much thought, if any, was given to the possibility that foreign interests would interfere with the Australian electoral process, or would have an interest in doing so. But now, in an environment in which commercial and political interests leapfrog national boundaries in ways that must have seemed a remote possibility when the 1918 Commonwealth Electoral Act was drafted, it is time to subject the act to a comprehensive revision. The aim of this exercise should be to exclude foreign donations. Those bans should extend to organisations engaged in the political process as lobby groups for one side or the other. It would make little sense for bans to be applied to political parties themselves without also extending such bans to unions and business lobbyists. As much as anything, such a provision would act as a deterrent to those who might seek to utilise foreign funds improperly. Government ministers tell you it will be difficult to frame legislation that would stop all foreign funding. What about grey areas, they ask, such as contributions by companies whose main business is in Australia, but whose headquarters is located elsewhere? The London-headquartered Rio Tinto is one such example. These are difficult issues and need to be worked through. There is no simple remedy. Of course, one option would be to make political campaigns fully publicly-funded, thus obviating the need for private fundraising. But that arrangement potentially discriminates against new entrants who may not qualify for such public funding. The Australian model in which funding is made available on the basis of past performance has merit. But its weakness is that it advantages the major parties disproportionately. Then there is the whole murky area of funding for organisations like the conservative Institute of Public Affairs, or groups on the left, like GetUp, which supports progressive causes. Under present circumstances, organisations like the IPA are not obliged to disclose their sources of funding. Since they are involved in the political process, these lobby groups should be required to open their books. In the United States, funding for similar organisations is transparent, for the very good reason that just as sunlight is the best disinfectant so is transparency in ascertaining what might motivate groups to adopt certain positions. The IPA, for example, opposed plain packaging for tobacco products on what it insisted were libertarian grounds. It would have been useful, however, to be apprised of whether the tobacco industry contributes funds to that organisation. Lobby groups should be obliged to place sources of funding on the public register, especially since many of these organisations derive tax benefits from their status as not-for-profit organisations. The whole question of “money talks” politics has come into focus in the past week or so with revelations in a Fairfax Media/ABC investigation of money being splashed around political parties by Chinese-born billionaires, one of whom is not an Australian citizen. Clearly, the aim of these contributions has been to influence Australian politicians in a way that would make them more sympathetic to China’s aspirations. 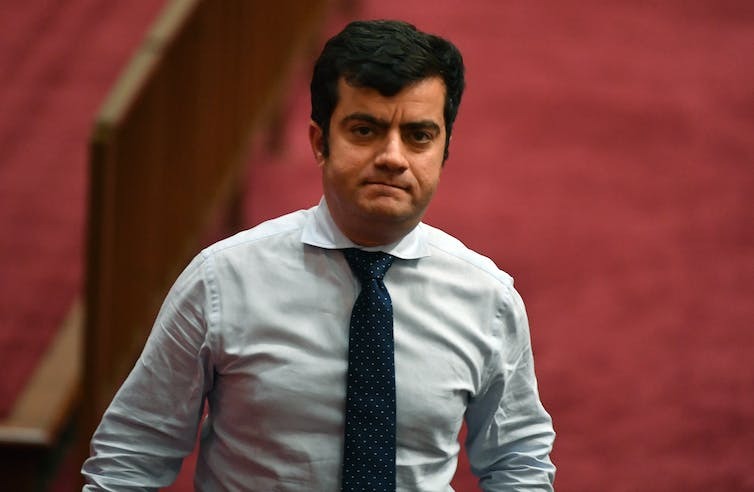 Indeed, in one case, funding that had been promised to Labor was withheld after one of its spokesmen advanced a point of view contrary to China’s interests. This was a clear example of money being used – or the threat of funds being withheld – for political purposes. It should be regarded as distasteful, and, potentially intimidatory. If there is a rule of thumb in politics, it is that money does not bring purity, rather the reverse. Special Minister of State Scott Ryan, who has responsibility for an overhaul of the Commonwealth Electoral Act as it relates to political donations, acknowledges that grey areas exist that will be difficult to legislate. In framing the required legislation, Ryan might refer to the Political Finance Database of the International Institute for Democracy and Electoral Assistance, an intergovernmental organisation that supports sustainable democracy worldwide. The IDEA has a formula that would be helpful in establishing exactly what constitutes a “foreign interest”. contribute directly or indirectly [and who are] governments, corporations, organisations or individuals who are not citizens; that do not reside in the country or have a large share of foreign ownership. In the case of the latter provision, framing regulations to stop foreign donations would present challenges. Rio Tinto is just one example of companies with large stakes in Australia, but domiciled overseas. Perhaps the most compelling argument for an Australian ban on political donations is that, apart from New Zealand, Australia is the only English-speaking democracy to permit such donations. In New Zealand, overseas donations are capped at $NZ1,500. In Australia no such cap applies. However, donations to parties and candidates above $13,200 require the name and address of donor to be supplied. This information must be made available at the end of each financial year. One reform Ryan might consider is to oblige disclosure more quickly. In last year’s federal election, Prime Minister Malcolm Turnbull made a very significant personal financial contribution to the Liberal Party campaign. But under law, this donation did not need to be disclosed in a timely manner. Turnbull did reveal his contribution – after the election and only under media pressure. In the case of that contribution it could be argued that wealth in Turnbull’s case enabled him to fund a campaign that gave him an advantage over his opponents. On the other hand, the conservative side of politics would say that Labor has an inbuilt funding advantage because it can rely on the support of the union movement. In recent years, several attempts have been made to clean up what is clearly an unsatisfactory state of affairs. In 2010, the Labor government introduced the Commonwealth Electoral Amendment (Political Donations and Other Measures Bill) that would have banned donations of “foreign property”. The bill passed the House of Representatives, but was not proceeded with in the Senate and lapsed at the end of the 43rd parliament. Labor and the Coalition toyed with the introduction of a donation and disclosure reform bill in 2013, but nothing came of these efforts. In this latest 45th parliament the Greens have restored their own Commonwealth Electoral Amendment Bill that bans donations of foreign property. This version lapsed at the dissolution of the 44th Parliament. Now is the time for this whole issue to be re-visited. Ryan, in conjunction with Attorney-General George Brandis, needs to come up with a bill that seeks to forestall the possibility of candidates and parties being bought and sold in a monied environment that is infinitely more susceptible to influence peddling by foreign interests than it was a century ago. During his Wednesday appearance at the National Press Club Malcolm Turnbull observed he was not a “political animal” like some of his opponents. He meant it as a virtue – he was extolling his pragmatism on energy policy. But he failed, to his detriment, to show a political nose on something closer to home. Having agreed that it would be desirable to have political donations disclosed in a more timely and transparent way (and flagging he opposed foreign donations), he then refused to say how much he had given in the last campaign. The latest donations list had come out only hours earlier but Turnbull’s contribution – speculated to be A$1 million or $2 million – was missing, apparently because of a timing loophole. So it was obvious Turnbull would be asked the question, equally clear that he would be called a hypocrite if he supported a general change but took advantage of the secrecy to which he is legally entitled. What was the point? The story, in the broad, is out there (unless the amount is much higher than suggested). The figure will presumably emerge officially in the next disclosure round – that much closer to the election. And his coyness just diverted attention from his main messages about jobs, energy, education and other parts of his 2017 agenda. How much he kicked in for his own re-election wasn’t the only delicate point on which Turnbull would not be drawn at the Press Club. Western Australia. This week the Herald Sun reported there had been talks between the WA Liberals and Pauline Hanson about preference swapping. Asked whether he would encourage WA Premier Colin Barnett to follow the precedent of Liberal predecessor Richard Court who did not preference One Nation, Turnbull said this was a matter for the WA division and for Barnett. Later he was asked how Hanson’s views might have evolved in the last 15 years that made her “in any way less offensive” than when John Howard put her last. And where would Hanson be on his how-to-vote cards next election? “I am not a commentator on the political evolution of One Nation,” Turnbull replied. In her first iteration, Hanson caused intense debate on the conservative side of politics about how her party should be handled. Many prominent Liberals argued passionately in terms of principle. It’s not like that any more. Second time round, Hanson has changed a little – but only a little. The Liberals seem to have changed a good deal more. We’ll see what happens at the federal election on preferences but in the meantime, power is power and Hanson, with her Senate position, has quite a lot of it. For Turnbull, despite abhorring many of her views, the relationship with Hanson and her party is all about transactions. Just as it is with Donald Trump and his immigration crackdown – on which Turnbull keeps his thoughts to himself – and that deal to take Australia’s offshore refugees. Turnbull had the refugee agreement, done with the Obama administration, reconfirmed in his weekend phone conversation with the President. But on Wednesday it become mired in fresh confusion and uncertainty. White House press secretary Sean Spicer reiterated that the deal, which he said involved some 1250 people, had the green light, while stressing there would be “extreme vetting” of proposed settlers. But then in a clarification to the ABC the White House cast doubt on how firmly it was locked in. The ABC quoted a White House source saying that if Trump did go ahead with the deal, it would only be because of the United States’ “longstanding relationship with Australia”. Turnbull remains publicly confident in Trump’s private assurance. The test of this confidence, and of the President’s word, will be how many refugees from Nauru and Manus Island eventually do land on US soil after the “extreme vetting” process. We might be waiting a while before we know the answer.